Thomas Moore was born August 6, 1815 in Kentucky. His father served in the War of 1812 and his grandfather served in the American Revolution. Thomas grew up on his father’s farm before studying medicine in Glasgow, Kentucky. He continued living and practicing medicine in that area until 1845 when he moved to Alabama. After eight years, he came to Texas in 1853 and immediately became politically active as he was made the Chairman of the first Texas Democratic Convention in 1855 when the party formed. Moore’s first home in Texas was in Marble Falls where he continued his work as a doctor for four years but he soon changed careers to practice law full-time. At present, it is unclear where and when Thomas Moore first became a mason but in 1857, Dr. Moore was one of the first Burnet County Masons to be advanced in degrees and exalted as a Royal Arch Mason by the newly chartered Mt. Horeb Royal Arch Chapter No. 57. As an attorney, he proved very capable and gained an impressive reputation quickly. Click to see a letter written to Moore about land taxes from Texas legend Jacob de Cordova. This reputation caused him to be elected to the 1861 Secession Convention where Moore helped to prepare a speech in favor of secession. It worked because Moore then became one of two men from Waco 92 to sign his name to the official Texas Ordinance of Secession document. The other was Moore’s eventual law partner and future governor Richard Coke. 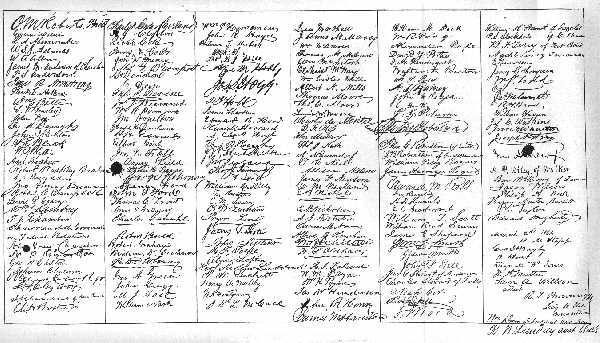 You can see Moore’s signature by clicking on the image below. It is ninth on the fourth row. During the war, Dr. Moore served the Confederacy as a receiver. This meant that his job was to confiscate and/or seize properties owned by Northerners in areas occupied by Confederates. After the close of the war, he was jailed with many others for having aligned with the Confederacy. Nearly three months of jail-time in Austin preceded his release due to the government not pursuing charges. 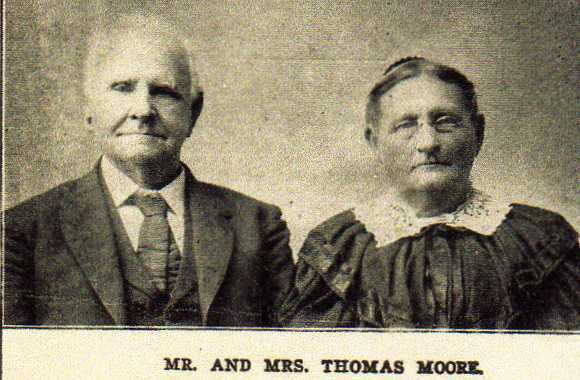 Soon thereafter, Moore sold his farmland in Burnet County and moved his family to Waco in 1867. Here, Dr. Moore set up a new law practice and was a leading local citizen for many years. He was active at the Church of Christ and at Waco Lodge 92. As such, Moore fancied himself a historian of churches and published many texts on the lives of American church leaders. This often led to requests for him to give public speeches after the death of prominent ministers across the country. He was a law partner of James Davis, Richard Coke, and he also mentored William Lambdin Prather. In fact, Dr. Moore’s sources of income were plentiful. He was a business partner of E. Sturgis and together they had a merchandise store on Bridge Street. He operated the Avenue Hotel on Austin Avenue and the Waco House/Waco Hotel which was a staple for visitors on Bridge Street for many years. When the hotel was burned down by an arsonist in 1878, Moore surprised the townspeople by quickly having it rebuilt. Dr. Moore continued to be very involved in politics and was made Democratic Chairman. The image at right is an 1875 plea by Moore to the people of McLennan County to ably represent themselves at the voting booths. In 1882, he was elected to serve as President of the area’s Prohibition movement and he also served as head of the Democratic Committee for many years. This political initiative proved to be a powerful one that caused great upheaval in Texas politics for many years. Much of Dr. Moore’s later years were spent on hunting expeditions all across the state with his friends from politics, church, and those he met at lodge. In 1898, Dr. Moore gave such a stirring speech after the sinking of the USS Maine that numerable men immediately enlisted to fight in the Spanish-American War. An amazing connection to Dr. Moore has been his namesake, Tom Moore, a prominent Waco attorney who is still practicing today in his 90s. That Tom Moore served in World War II, was McLennan County’s District Attorney in the 1950s, and prosecuted the first trial to be televised in the United States. In the 1960s and 70s, he served in the State House of Representatives where he famously played an April Fools’ Day prank to prove that legislators don’t always read the laws passing before them.